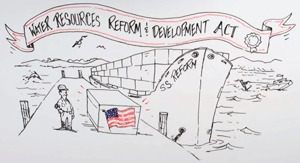 Last week, the House passed the Water Resources Reform and Development Act (WRDAA). The passage of this bipartisan bill is a victory for North Texas families because it will help strengthen our economy, spur job creation, and promote America’s competitiveness. Specifically, WRRDA authorizes key missions of the U.S. Army Corps of Engineers to develop and maintain our waterways, streamlines permitting processes, and expands public-private partnerships. Click below to learn more about WRRDA. At time when our federal government spends far too much, I’m glad to report that WRRDA contains no earmarks and is fully paid for by deauthorizing old, inactive projects. I was proud to support this responsible bill this week and hope that my colleagues will continue to join me in fighting for policies that encourage economic growth and fiscal responsibility.